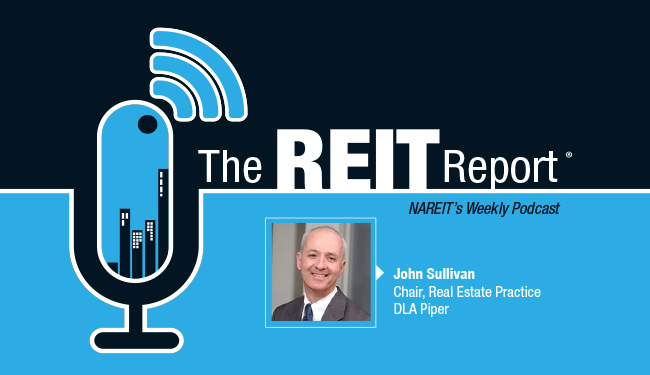 In the latest episode of The REIT Report: NAREIT's Weekly Podcast, John Sullivan, chairman of DLA Piper’s real estate practice, discussed the results of the firm’s annual survey of real estate executives. Sullivan said the survey showed that real estate company executives remain “generally bullish” on the commercial real estate market. The level of optimism has dropped slightly from a year earlier, according to the survey. Regarding the ongoing transitions in retail real estate, Sullivan said the executives had a relatively positive outlook for the sector. He pointed out that more than two-thirds of survey respondents expressed confidence in the ability of retailers to adapt to changing market conditions brought on by online retail. Looking at the capital markets, Sullivan said executives are predicting that the interest of foreign investors in U.S. real estate will remain high. In addition to China, Sullivan said investors from Canada, Germany, Norway and South Korea are expected to be among the major sources of capital for U.S. real estate. In terms of areas of concern, DLA Piper’s survey identified the slowing of the Chinese economy as one potential problem.